Twitter has released Vine for Android, bringing the 6-second video sharing service to Google’s mobile OS for the first time. The Vine app is available for Android smartphones right now, and is a free download for anyone running Android 4.0 or higher. The Vine app for Android arrives just about five months after it arrived on iPhone, when Twitter launched the app back in late January after acquiring the startup behind Vine. In that time, it has managed to amass an impressive 13 million users on iOS alone. The version that arrives today for Android isn’t necessarily feature complete; the official Vine site says that it will be delivering a host of new features in future updates, including access to the front-facing camera, push notifications, the introduction of hashtag and mention features, and searching for both people and tags. These will arrive in “frequent” updates according to the company. 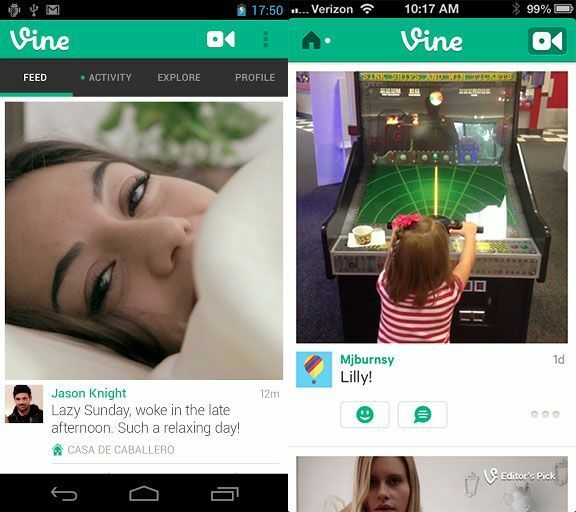 Already, the Vine app for Android has a unique Android feature, as it supports zooming on both the Galaxy S4 and the HTC One. Vine previously updated the iPhone app to add some of these features, including use of the front-facing camera, people mentions in posts and comments and improved people search in a big update that arrived at the end of April. Twitter’s Vine team appears to have taken the approach of launching a basic product and refining it on iOS, and now looks primed to do the same on Android. The tech world will be watching the next few weeks closely to see what effect Vine’s arrival on Android has on its user base, and there’s a pretty obvious opportunity for comparison ready at hand: Instagram. Instagram launched on Android back in April of 2012, after managing to build a user base 30 million strong on iOS. The photo-sharing app then added a million new users in just 12 hours thanks to Android users flooding the service. Twitter had said that Vine would be coming to Android “soon” back at the end of April, though they didn’t offer a more specific date when it confirmed that impending release. Its launch today should certainly prompt a spike in new users, though just how many remains to be seen.